2. Install the files to your Google SketchUp directory. 4. 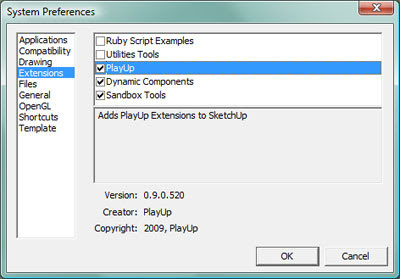 Go to Window > Preferences > Extensions and check the PlayUp box to enable the plugin. 4. Go to Plugins > PlayUp > Preferences. 5. Select the engine you wish to export to and specify the correct path information for the engine in the corresponding tab. NOTE: If you run into problems with the exporting process, it's very likely that you did not set up your paths correctly so please make sure you specify the correct locations. If you are exporting to Half-Life 2, you need to select "Half-Life Source: Episode 1". If you are exporting to Team Fortress 2, you need to select "Half-Life Source: Orange Box". Remember, you need to download the SDKs for your given engine before you can export anything. For Source, you can download the SDK through Steam. 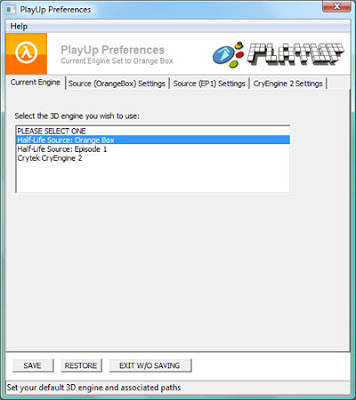 For CryENGINE, you can download it from here. For Unity 3D, you can get it from here. Once you have your SDK installed and the paths correctly specified, you're ready to give it a go. Make a model and texture it. Select it and make it a component or group. Right click the model and you will see a choice for PlayUp Properties. Note that this option will not appear if you did not make your model a component or group. 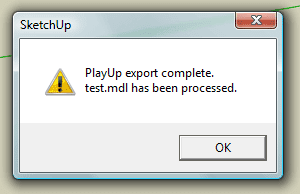 Only components and groups are exported by PlayUp. In PlayUp Properties, you can Enable Collision (supported in Source only at this time), Set as a Spawn, Turn Static Off, or Export Selected Geometry. By default the model is "static", but should you want to bring it in as "dynamic" you can turn it off here. You cannot currently make dynamic models in SketchUp, however we have put this flag in place to be able to export it as dynamic if you choose. If you set a component or group as a spawn, it will disregard the dimensions and create a spawn point at the origin of the entity. Exporting selected geometry will just export the currently selected component or group as a singular model. You can export a single model by right-clicking and going to the PlayUp Properties, or you can export all the visible components by going to Plugins > PlayUp > Export All Components and Groups. Exporting components with nested components and groups will create prefabs. When the process has completed, a window will appear letting you know. For Source, you can also export a level by going to Plugin > PlayUp > Export Level. This will generate a VMF file which you can then open in Hammer. Since we do not yet support BSPs, this file will automatically have a generic BSP box (with a skybox texture) and spawn for you to modify or delete. This allows you to quickly launch Hammer and run the map so you can see what your models look like in the engine. We have also added the following icon to the interface. Clicking this icon will toggle a style that clearly shows you the normals. Dark gray faces indicated the front side of the face, whereas bright green faces show the back side. We encourage you to use this tool to check your models before exporting. PLEASE NOTE: Level export is also not yet supported in CryENGINE 3. We are currently in the early stages of supporting this engine and plan to have more functionality in future builds.